A worker dismantles electronic products under safe conditions. Under its contractual obligations with commercial customers, this formal recycling facilty does not refurbish electronics or salvage parts for reuse. While some metals are sold to local markets, components such as circuit boards, copper cables, and plastics are baled and prepared for export for further processing. The emergence of the formal sector potentially gives rise to competition with the informal sector for the same materials. Understanding the relative strengths of both entities and the benefits they both bring to society is important to allow for different forms of employment to flourish. In addition, pinpointing where vulnerablities exist in safely recycling these products-- such as informal CRT glass disposal-- and recognizing the socio-political dynamics that limit collaboration between the formal and informal sectors is critical for forging a system where both can thrive. 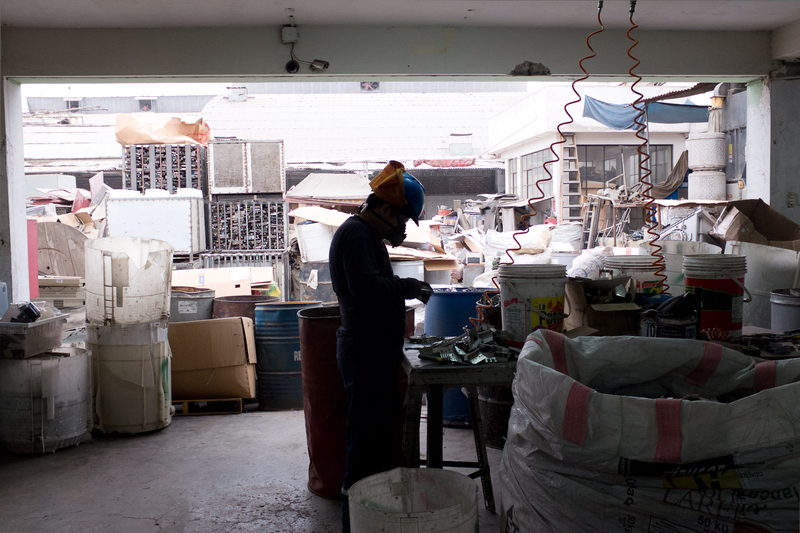 Finally, given technological constraints among Peru’s formal recyclers, stakeholders should look to shore up certification of best recycling practices in key regions, such as Asia and the United States, so that all countries who must export material have access to sound end-of-life processing methods that are transparent for all, or build up local recycling capacities through technology transfers.